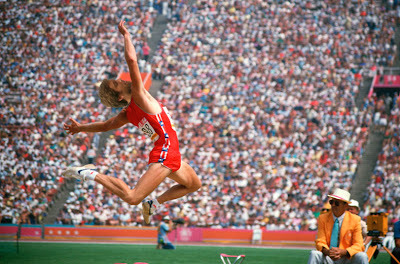 Here I am in a track meet in high school. Go Hornets! I don't think I broke any records on this jump, but it looks pretty cool. I think the photos below were the scene across the country yesterday. 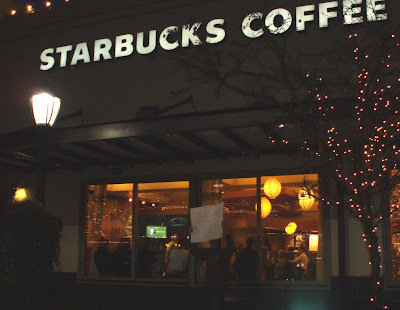 Starbucks closed all its U.S. stores for 3 hours at 5:30 local time to retrain its employees. I live in Seattle. What were people supposed to do for coffee during those 3 hours? 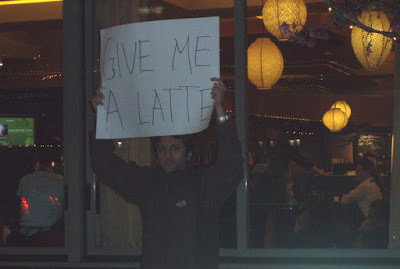 Even though I don't personally drink coffee, I wanted my voice heard, so I demonstrated outside the busiest Starbucks in the country (U-Village). Mainly I chanted things like, "Give me a latte" and "We need coffee" but I also said, "Three hours is too long" a couple of times. My favorite part was that all the employees were just inside the window where I was demonstrating and the guy in charge squinted to see what was going on outside. Just me demonstrating, Sir. 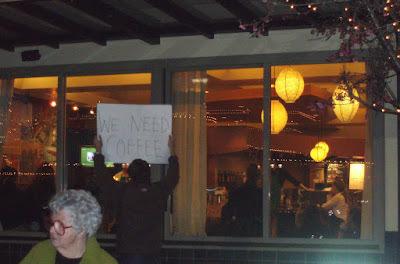 How could you leave millions without coffee for 3 hours while you taught your people how to make the "perfect" coffee? Do you think they can just go to Tully's or Seattle's Best or some little coffee shop? No way! 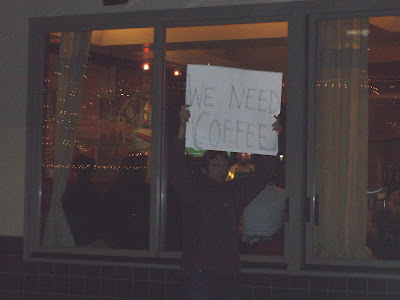 They need their Starbucks! Demonstrating made me a little nervous (I'm not usually an activist) but I think I got my point across. I'm pretty sure it's good when people stare at you. 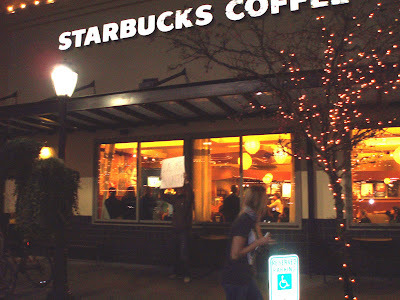 Here are the baristas being trained inside. Listen to ME! Sometimes the best way to make your voice heard is with posters. Oh, am I interrupting something? So sorry to inconvenience your little meeting! A photographer from the Seattle Post Intelligencer took some pictures of me and wrote my name down, but I don't think I made it into the paper. Too bad, because I bet his camera was better than mine. These photos are grainy! A number of Robin's friends have recently asked her what I do to work out. Obviously, my toned and muscular physique invites comments and questions like this. So, as a courtesy I thought I'd document my strict regimen for you. You can't go wrong with a Costco-sized box of Oreos. All those reps really shape the biceps (see photo). Everyone knows crosswords are great for the mind AND body. Hmmm, what's a 4-letter word for "Huge muscles" that starts with "G"? Naps are essential after a hard workout. They help the muscles to regenerate. I find that the yoga ball is the perfect supplement to my TV watching. If this is what a yoga class is like, sign me up. All this leads to a fit body. Wow, look at those guns (a four-letter word for "Huge muscles"). You probably should watch this video. It will make you laugh. Out loud. And then you'll think, "Wow, my day just got a little better. Thank you, Oh Pepper?" And then I'll say, "Don't thank me. Thank Jean Mansel of Rockford, Michigan." 1. The reporter's very serious voice, even when he reads the word "wiener poopie" over and over. 2. The way Jean looks at the camera with a disgusted look after reading the word "wiener poopie." 3. The way Jean analyzes the situation and concludes that the culprit must be kids because adults wouldn't write little lines around the word "Jesus." 4. The way Jean imitates the raspy voice who called about the ransom. 5. The way Jean says she thought "something like that would be safe in your yard" and then pauses and solemnly concludes, "It wasn't." 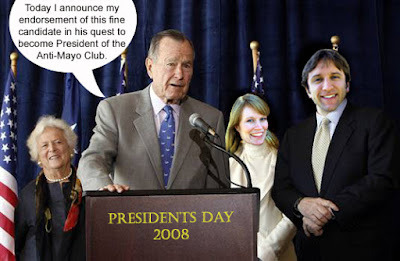 --George W. Bush is our 43rd president, but there actually have only been 42 presidents: Cleveland was elected for two nonconsecutive terms and is counted twice, as our 22nd and 24th president. --Eight Presidents were born British subjects: Washington, J. Adams, Jefferson, Madison, Monroe, J. Q. Adams, Jackson, and W. Harrison. --Nine Presidents never attended college: Washington, Jackson, Van Buren, Taylor, Fillmore, Lincoln, A. Johnson, Cleveland, and Truman. The college that has the most presidents as alumni (six in total) is Harvard: J. Adams, J. Q. Adams, T. Roosevelt, F. Roosevelt, Kennedy, and G. W. Bush (business school). Yale is a close second, with five presidents as alumni: Taft, Ford (law school), G.H.W. Bush, Clinton (law school), and G. W. Bush. --Presidents who would be considered "Washington outsiders" (i.e., the 18 presidents who never served in Congress) are: Washington, J. Adams, Jefferson, Taylor, Grant, Arthur, Cleveland, T. Roosevelt, Taft, Wilson, Coolidge, Hoover, F. Roosevelt, Eisenhower, Carter, Reagan, Clinton, and G. W. Bush. --The most common religious affiliation among presidents has been Episcopalian, followed by Presbyterian. --The ancestry of all 43 presidents is limited to the following seven heritages, or some combination thereof: Dutch, English, Irish, Scottish, Welsh, Swiss, or German. 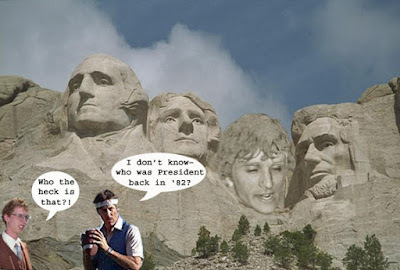 --The oldest elected president was Reagan (age 69); the youngest was Kennedy (age 43). Theodore Roosevelt, however, was the youngest man to become president—he was 42 when he succeeded McKinley, who had been assassinated. THE OLDEST LIVING former president was Gerald Ford, who was born on July 14, 1913, and died on Dec.27, 2006, at age 93. The second oldest was Ronald Reagan, who also lived to be 93 years. --The tallest president was Lincoln at 6'4"; at 5'4", Madison was the shortest. --Fourteen Presidents served as vice presidents: J. Adams, Jefferson, Van Buren, Tyler, Fillmore, A. Johnson, Arthur, T. Roosevelt, Coolidge, Truman, Nixon, L. Johnson, Ford, and George H.W. Bush. --Vice Presidents were originally the presidential candidates receiving the second-largest number of electoral votes. The Twelfth Amendment, passed in 1804, changed the system so that the electoral college voted separately for president and vice president. The presidential candidate, however, gradually gained power over the nominating convention to choose his own running mate. --For two years the nation was run by a president and a vice president who were not elected by the people. After Vice President Spiro T. Agnew resigned in 1973, President Nixon appointed Gerald Ford as vice president. Nixon resigned the following year, which left Ford as president, and Ford's appointed vice president, Nelson Rockefeller, as second in line. --Four Presidents won the popular vote but lost the presidency: Andrew Jackson won the popular vote but lost the election to John Quincy Adams (1824); Samuel J. Tilden won the popular vote but lost the election to Rutherford B. Hayes (1876); Grover Cleveland won the popular vote but lost the election to Benjamin Harrison (1888); Al Gore won the popular vote but lost the election to George W. Bush (2000). --The term "First Lady" was first used in 1877 in reference to Lucy Ware Webb Hayes. Most First Ladies, including Jackie Kennedy, are said to have hated the label. --James Buchanan was the only president never to marry. Five presidents remarried after the death of their first wives—two of whom, Tyler and Wilson, remarried while in the White House. Reagan was the only divorced president. Six presidents had no children. Tyler—father of fifteen—had the most. --Presidents Lincoln, Garfield, McKinley, and Kennedy were assassinated in office. --Assassination attempts were made on the lives of Jackson, T. Roosevelt, F. Roosevelt, Truman, Ford, and Reagan. --Eight Presidents died in office: W. Harrison (after having served only one month), Taylor, Lincoln, Garfield, McKinley, Harding, F. Roosevelt, and Kennedy. --Presidents Adams, Jefferson, and Monroe all died on the 4th of July; Coolidge was born on that day. --Kennedy and Taft are the only presidents buried in Arlington National Cemetery. 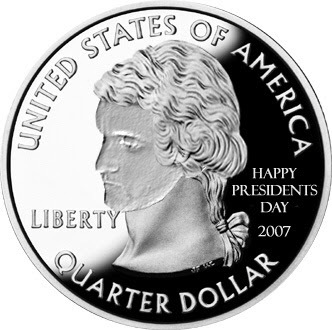 --Lincoln, Jefferson, F. Roosevelt, Washington, Kennedy, and Eisenhower are portrayed on U.S. coins. --Washington, Jefferson, Lincoln, Jackson, Grant, McKinley, Cleveland, Madison, and Wilson are portrayed on U.S. paper currency. 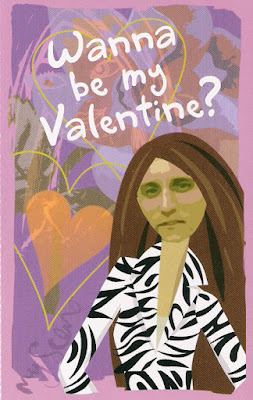 Happy Valentine's Day, wife. 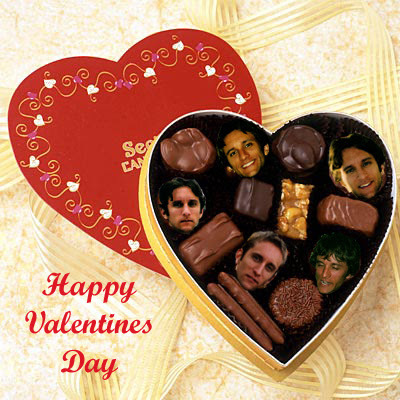 Even though this holiday is a conspiracy masterminded by chocolate makers, card printers, and flower shops everywhere, I made you a homemade card with your favorite photo of us. 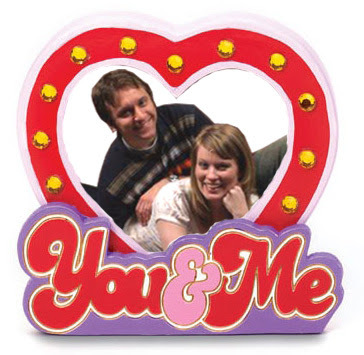 2007: Wow, these are two really happy people. And this was taken at Cirque du Soleil! 2006: When it comes down to it, I'm really an ugly cartoon. 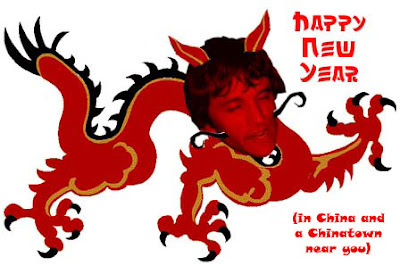 2005: Top ten all-time holiday greeting idea. 2004: Not bad for MS Paint. In case you didn't know, Boy Scout Day celebrates the birthday of Scouting in America. On February 8, 1910, William Dickson Boyce filed incorporation papers in the District of Columbia to create the Boy Scouts of America. 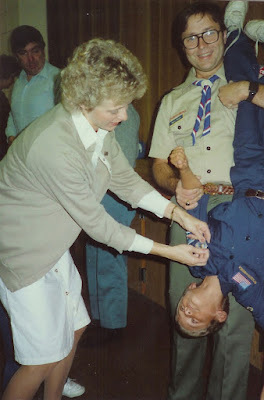 The fathers of most girls I dated asked me whether I was an Eagle Scout. I didn't quite make it to Eagle but after much time and effort, I did achieve the Bobcat rank. Let me tell you the story: I was a Bobcat, living the life at events like the Pine Wood Derby. Then one day our troop was supposed to go door-to-door selling donuts to raise some money. I told my mom I didn't want to do it. She said, "Well, you can't do fun things like the Pine Wood Derby if you don't do the fundraisers. You have to do everything or nothing." So, obviously I chose nothing. The Pine Wood Derby is overrated anyway. Here I am receiving my Bobcat rank. No, that is not my dad holding me. He would never have worn a braided leather belt like that. **this post has been graciously brought to you by robin, since the tough little bobcat is curled up on the couch for the 3rd day straight. marrying an eagle scout is also overrated... i mean, as long as he can photoshop, what more do you need? Robin and I found a new favorite Teriyaki place right by U-Village. It's called Nasai Teriyaki. It's our favorite not just because they have really good chicken bowls, but for many other reasons that will soon be apparent. Please read on. ...like this one. I really like how Teriyaki places have the pictures of the dishes on the wall so you can see what you're ordering. 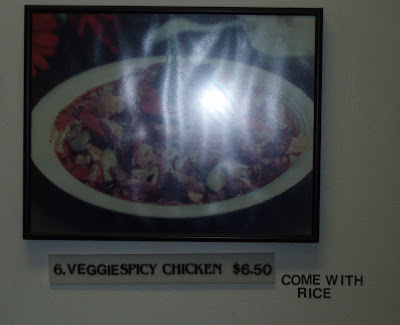 But I especially like this one because of the "COME WITH RICE" line. Matching up the correct conjugation with its subject is overrated, anyway. This is on the wall by the photos of the dishes. I have no idea what this stuff means. But you gotta love it. 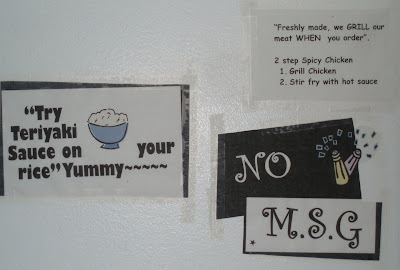 Especially the 2-step Spicy Chicken instructions. More grammar fun. This is the sign in the front window. 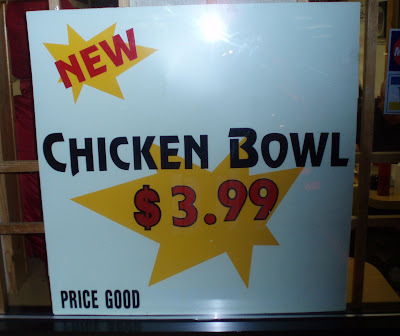 I don't know why "PRICE GOOD" is so much funnier than "GOOD PRICE" but it is. 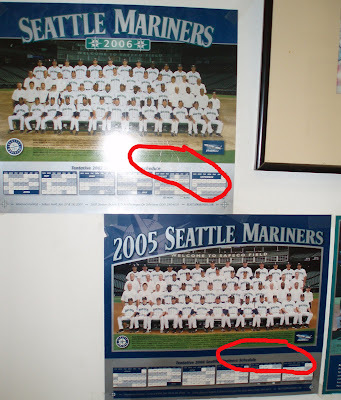 They have about six years' worth of Seattle Mariners team posters on the wall. This is funny because someone wrote "LOSERS" on every photo with an arrow pointing to the team. Only instead of writing "LOSERS," he/she wrote, "LOOSERS." I think we can agree that the only thing funnier than bad grammar is when you use bad grammar while insulting someone else. This is a lawsuit waiting to happen. Thanks to law school, I know that a merchant's duty of care to its customers is to warn them of known and unknown dangers. 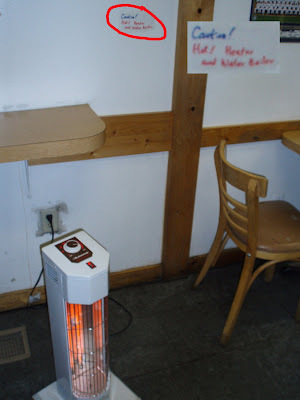 In this case, I'm not sure the sign on the wall, handwritten in magic marker, to the side of the space heater, is sufficient. Plus, I love what it says: "Caution! Hot! Heater and Water Boiler." Not sure where the water boiler is, but that's cool. And finally, yes you can have free water with your meal, but you have to pour it yourself. From a pitcher. 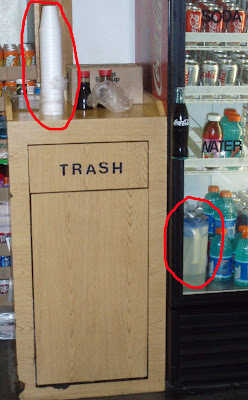 In the fridge that holds the other bottled beverages for sale. Is this in compliance with the Health Code? 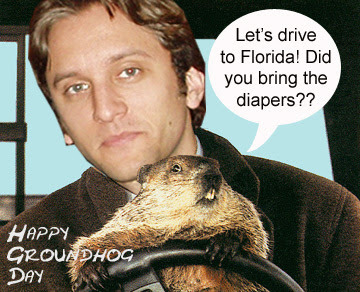 A Happy Groundhog Day to all! 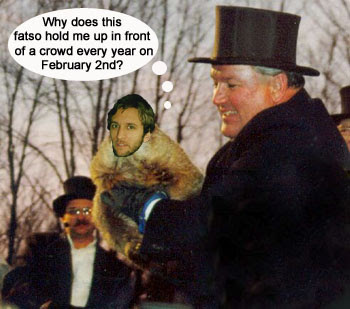 --Punxsutawney held its first Groundhog Day in the 1800s. The first official trek to Gobbler's Knob was made on February 2, 1887. I'd like to know who was the genius who said, "Hey everyone, I have a great idea. 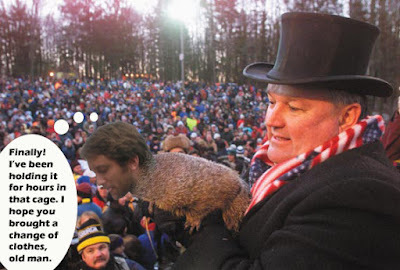 On February 2, let's walk a couple miles out of town to Gobbler's Knob, hold up a groundhog, pretend to hear him say whether he saw his shadow, and then proclaim that winter will be longer or shorter than usual, based on his 'answer.'" And I'd like to know who heard this idea and actually did it. And yet, 121 years later, people are still doing it. 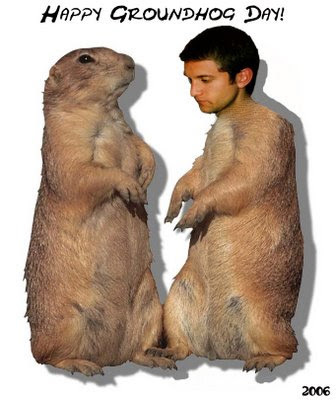 --The average groundhog is 20 inches long and normally weighs from 12 to 15 pounds. Punxsutawney Phil weighs about 20 pounds and is 22 inches long. In contrast, I weighed 8 pounds and was 22 inches long when I was born. Sounds like I would have been a skinny groundhog. --A groundhog can whistle when it is alarmed. Groundhogs also whistle in the spring when they begin courting. 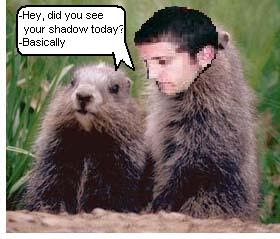 I guess humans and groundhogs have more in common than you think. --Young Groundhogs are usually born in mid-April or May, and by July they are able to go out on their own. The size of the litter is 4 to 9. A baby groundhog is called a kit or a cub. A groundhog's life span is normally 6 to 8 years. I've never even seen a groundhog so I'd like to know how one becomes a groundhog expert and knows all this stuff. 2007: If you don't remember the Astronaut Love Triangle, you probably won't laugh at this. 2005: My favorite part of this one is how I used a photo of me with a beard. I think it fit just right.